This add-on will allow you to get a message posted to the FIFO message system (the messages that appear near the top of your screen) or to a dedicated window whenever a friend or guild member goes on- or offline. 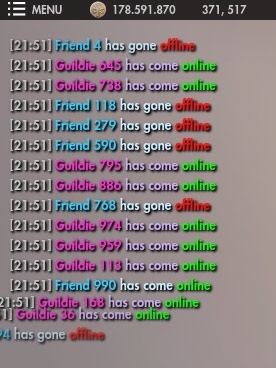 You can toggle the messages for when friends come online, when they go offline and when guild members come online and when when they go offline. 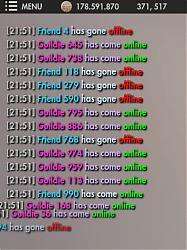 If you have a guild member also added as a friend it will only show the friend message and not the guild message as well. You can also set a bunch of options for the dedicated window to make it fit your liking. You can now customize the message strings used for when people go on- and offline. This means you can localize it and do whatever you want with it. The new customized message string accepts some identifiers. Read the newly added help for instructions. Added a help section to the add-on. Click the question mark icon next to the close icon in the options window. Help also explains the "Slave Mode". Removed the option to include time as this is now an identifier for the message string. New option called "Slave mode" added. Will allow other add-ons to send online/offline messages to TCAG to use the display modes available in TCAG (so they don't have to make something similar, when I can just open up my add-on for it). Enabling slave mode means TCAG will no longer report on its own and only process messages from other add-ons. Look forward to an upcoming version of Valyrie's Friends Enhanced which will take advantage of this. Changed the options window code to a newer version. Slightly adjusted the test message system (for instance the messages are now cleared on stop). Actually fixed the issue with right aligned text placed close to the right border of the screen. Fixed dedicated window resetting its position if placed too far to the right. Added option for controlling the text alignment. Added option for setting the time it takes for the text to appear. Added option for setting the time it takes for the text to fade out. Added option for setting the amount of pixels it will travel when sliding in from either side. Lovely options UI instead of slash commands (those have gone away, but it can still open/close the options window). Fixed so people on your ignore list won't show notifications. This happened when a friend was added to your ignore list. Funcom doesn't remove the friend from the friends list in that case and thus my add-on didn't know any better. Now keeps the different lists up-to-date during gameplay.